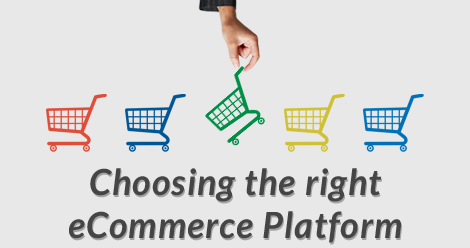 How to choose a right platform for your online store? Choosing the right platform for your business is slightly confusing and this decides the future of your business. There are millions of eCommerce sites available nowadays. So you should be very careful while choosing the platform. An eCommerce store is one of the most profitable businesses. In earlier days managing an eCommerce store was very difficult, but nowadays technology has changed a lot. So one can easily manage an eCommerce store by choosing the right platform and hosting it with the right providers. Both hosted and self- hosted eCommerce platforms are available today. The best example of a self-hosted platform is Magento. You can download it on your own and then you need to choose the best hosting provider that best suits you. If you are planning for a self-hosted solution then the best hosting is Aspiration Hosting. Aspiration Hosting is known for its Customer Satisfaction. Our technical team consists of experts who are capable of handling any issues related to Magento. You can launch your store immediately when you sign up for a hosted eCommerce solution. The best example for a hosted solution is MagePlus. So it will give you an installed and configured Magento store in just one day. Also with MagePlus, you don’t have to worry about the technical details, as our techs will configure the site for you. SSD drives – SSD drives are 20 times faster than SATA drives and 3-4 times faster than HDD. Therefore, you will get fast hosting for your websites. Regular backup – Regular backing up of your website will help you to meet any unpredictable emergencies. Aspiration CDN helps your website to load faster around the world. Regular scanning of the server helps protect you from any possible threat of the virus. Softaculous or Installatron installers with the cPanel. We have servers around the world, which will help the websites to load faster with your customers. The final decision on choosing the right platform depends on your company’s goals and objectives. Aspiration Hosting will be with you for any help at any time.